It's an average day and you are at the grocery store looking over the fresh produce when out of nowhere pops a news reporter who shoves a microphone in your face and asks, "Do you think you are a beautiful woman?" You blink at a close-up camera and answer....what? Yes? No? Maybe? Even if you got yourself together before leaving the house today, would you give an unqualified, "Yes, actually. I do think I'm beautiful!" I hope so. Because you really are. Everyone is truly beautiful in her own, and unique, way. "Oh, sure", we rationalize,"That's what everyone says. But I could never measure up against the latest hot (and skinny) model, or that young new movie starlet. Now she is really beautiful. Next to her I look pretty ordinary at best. I could never compete with her kind of beauty." But why do we do that to ourselves-- measuring ourselves against someone else, only to decide that if we don't measure up to whatever standard "she" presents, and that we can only fail the test? Why do we put ourselves on some unwritten sliding scale of what "is" and "isn't" beautiful, and then define our own position on that line between "#10 Beautiful" and "#0 Ugly"? That scale does not, in actuality, exist. Such comparisons are unnecessary and unkind. And untrue! True, we do not all necessarily reveal our true beauty to ourselves, or to the world. Some days, perhaps, more than others, we manage to keep it hidden. We don't take the time or the effort to pull ourselves together as we start out each day. We are "too busy" to take the time to get that bath, wash and dry that hair, put on that makeup, or dress in a way that makes us feel really good about ourselves TODAY. We excuse ourselves by saying, "I'm only staying home today." Or, "I'm only going to make a quick run to the grocery store--nobody will see me." Because we really don't think that we are worth the effort. Who cares? I'm nobody important, so it doesn't matter. Wrong! You ARE important. Just as important as that picture-perfect model you imagine you don't measure up to. You know, the one who spends most of her life lavishing attention on herself at the spa, at the gym, and in front of the mirror? If you really believe that you are beautiful you will put yourself at the top of your list each morning when it comes time to make yourself presentable for the day. You might not be able to look like anyone else, but you can, and should, look like the very most beautiful version of YOU. It might just take a few minutes longer to go from "Okay" to "Wow, I'm not bad at all! ", but you deserve to invest in yourself each day. If you believe that you really are beautiful--with that special style of beauty that is totally unique to you--then you will take that time. My maternal Grandmother did this. She wasn't thin. She wasn't young. She didn't have much money; in fact she was quite "poor" by anyone's standards. But Grandmother never, but NEVER, presented anything but her most beautiful self to the world. No matter if she never left the confines on her little trailer that day. No matter if she expected a visit from anyone. She did it for Herself. She had the pride of believing in her own special beauty. No Matter What. Even when she felt bad. Even when she was flat broke. Even when she was all alone. My Grandmother got up, cleaned up, and fixed up. You never saw her without a nice clean dress, her grey hair combed, a little powder on her nose, and wearing her "jewels" as she called them--simple dime store beads and earrings. And you know what? She really was beautiful! My mother used to put it this way. "Not every woman can be what the world calls Beautiful. But every woman can be Attractive." And she was. With all of her own typical "imperfections", she could still make heads turn. She knew how to make the most of what she was given, and she was truly beautiful in her own way, too. She knew that most of what makes "beauty" is simply confidence in ourselves. If it takes a little time in the morning to put on that confidence--and the smile that seals it-- it is well worth the investment. Strong women are comfortable with their own personal style of beauty. Some women have a "feminine" style of beauty. Some have an "athletic" style. Or a "Boho" style. Or whatever style they like. But they all accept their physical differences from others, and don't consider them to be "flaws". Who says a certain shape of nose is better than another? Or one particular body form is preferable? Those things can and do change with the times, as any student of history can attest. But strong women don't accept one rigid standard of what is or is not beautiful. They can joyfully appreciate the beauty of others without considering it to be a devaluation of their own. They do not accept the social whims of what is and is not "beautiful", realizing that worldly standards change with the wind. 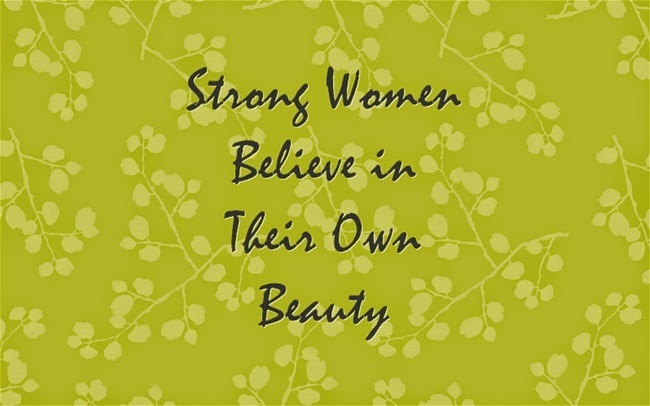 Strong women determine for themselves what they consider to be beautiful, and are not swayed by the opinions of others. They love themselves enough to keep their bodies healthy, strong, and well-groomed. They are confident enough in their own beauty to avoid resorting to being overly ostentatious, loud, or immodest. They are not desperate for attention. They don't need anyone else's affirmation. They start each day by presenting themselves at their very best, even if they will be alone all day, and then move confidently on to other things. The best thing about being confident in our own beauty when we walk out of our bedroom each morning is that it frees us up to think about others the whole rest of the day. And devoting ourselves to our family, our friends, and others is what makes us most beautiful of all. Thank you so much for those amazing words. You are so right on, Margaret. We have a tendency to forget that we should be beautiful for our husbands. There are plenty of other women out there who would love to!